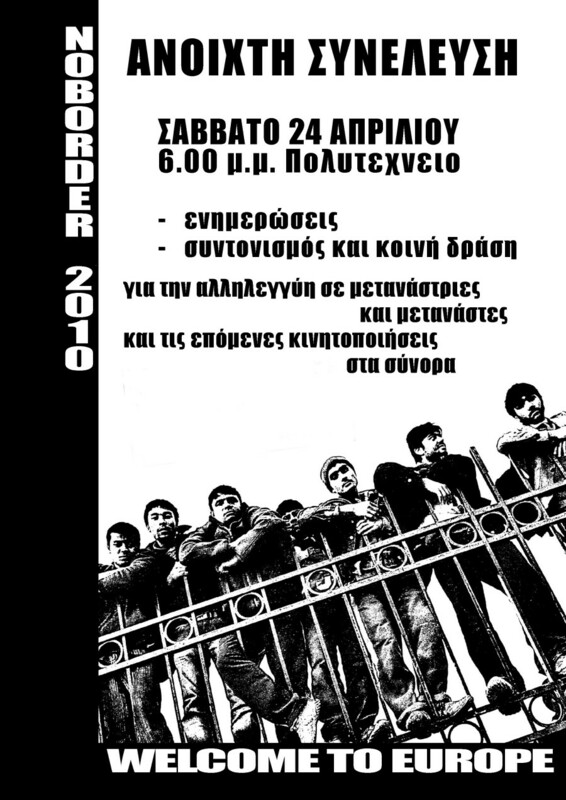 Published on July 2, 2010 in Detention, Featured, Frontex, Lesvos and Photos. 1 Comment Tags: 2010, chronicler, report. When you walk along the port of Mitilini, the capital of Lesvos island, you can hardly oversee that you are moving in a militarized zone of migrant-hunters. The greek coast-guard and the European border agency Frontex are even more obviously present than last year. The ship of the Rumanian coast guard (a lot of people might know it from last years Noborder-activities) looks small and almost friendly besides the more than double-sized grey vessel, named “Arago” from France. The “Arago” participated already in September 2008 in the Frontex-Mission Nautilus between Lampedusa and Malta. Even too big to be placed in the closed part of the port, it has to be parked in front of the Blue Sea Hotel. Sometimes it is also “hiding” near Petra on Lesvos’ north coast, the main arrival coast of the last years. In the main port in Mitilini the coast-guard is again present and the small hunting-speed-boats that had shown their manoeuvring in the harbours action last August as well. Published on April 19, 2010 in Athens. Closed Tags: 2010, assembly.